Asmita, 55, who was born in Tanzania, contracted polio at the age of 2yrs, resulting in curvature of the spine and reduced ability to walk unaided. 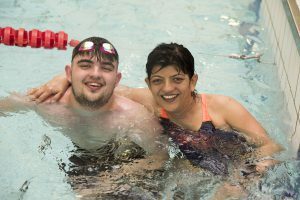 When her family moved to England in 1975 she attended Aspley Wood School which focused on supporting children with special needs and it’s there that Asmita learnt to swim as part of her 1:1 physiotherapy sessions. With her physiotherapists help she built up her upper body strength and was soon regularly swimming at Beechdale Baths and taking part in sponsor swims to raise funds for the school. It was her son, Christopher, who is also a lifeguard at Clifton, who encouraged her to start swimming again and having rekindled her passion for it. 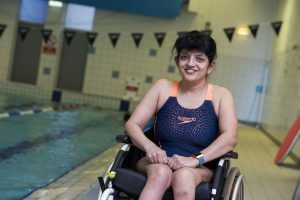 Asmita now swims five mornings a week utilising her Flexible Fitness Swim and Health Suite membership to the maximum with regular sauna, steam room and Jacuzzi sessions too. Christopher regularly joins her in the pool before work and along with other staff, is there to help with getting in and out the water. Volunteering has always played a large part in Asmita’s life, helping out at Aspley Wood School for over 16 years and she’s now heavily involved with the Nottingham Community and Voluntary Service. Having successfully completed a Level 1 Swimming Teacher Certificate as part of the InstructAbility project, you will probably see her pool side at Clifton, volunteering on Mondays and she’s hoping that she may be able to take her new skills further and look for paid teaching work in the future. Things haven’t always been easy for Asmita and she’s overcome many obstacles in life, but she says these have only served to make her stronger and more determined to grab every opportunity to enjoy life. If you live in Nottingham City and have a registered disability you can save up to 50% discount off activities, so why not join Active Nottingham today?